BB King, who became the face of the American blues worldwide and an inspiration for generations of rock guitarists, has passed away. He was 89. 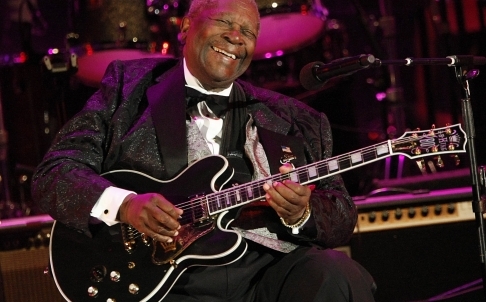 King – almost as well known as his “woman”, the Gibson ES-355 guitar he named Lucille – died in Las Vegas, which was the blues legend’s primary residence amid years of incessant travel, his daughter said. King kept up a gruelling touring schedule even in his 80s, despite living with Type II diabetes for more than two decades. To Hong Kong fans, King may be best remembered for his live concert in 1994. He came after he was flown in to Beijing to officially open the city’s Hard Rock Café. 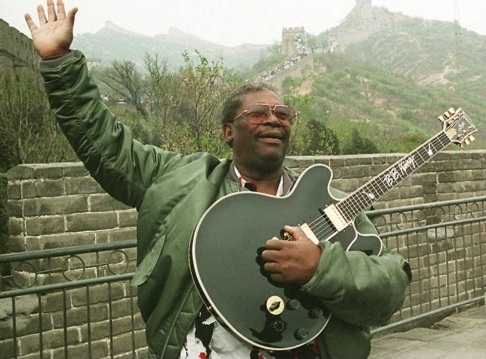 While in the Chinese capital, King was photographed on the Great Wall with Lucille. The Asian tour also saw him play in Taipei, Singapore, Japan and Australia. “The King of the Blues”, as he was universally known, led a life of non-stop touring, electrifying audiences in some 100 countries with his biting guitar licks and soulful songs of love and angst such as The Thrill is Gone and How Blue Can You Get. King for decades gave upwards of 300 concerts a year, racking up 15 Grammy awards. Rising from sharecropper poverty in deep Mississippi, King was a consummate entertainer with a husky baritone who made a successful crossover from traditional African American audiences to rock and pop fans. Lucille was named after a woman who was the focus of a fight between two men in Arkansas that led to a house being set on fire and King nearly being burned to death as he tried to rescue his instrument. Through the guitar, he delivered an unmistakable mix of slow but sharp bite and long, moaning bends that influenced other guitar legends such as Eric Clapton, George Harrison and Stevie Ray Vaughan. Eventually he made his way north to Memphis, Tennessee, a music capital which was to become his longtime base. Blues legend Sonny Boy Williamson put King on his radio show, where he made such an impression the young musician soon got his own programme, Sepia Swing Club. On the radio he took the nickname Beal Street Blues Boy, then shortened it to Blues Boy King, and then B.B. King. In 1949 he made his first six singles, and two years later hit paydirt with Three O’Clock Blues. It held the number 1 slot on the national rhythm and blues charts for 15 weeks. He developed his distinct style in the 1950s as he toured incessantly with his band. He never took up the slide guitar like most Delta bluesmen, but substituted with a vibrato from his left hand on the neck that rounded out his unique sound. “By bending the strings, by trilling my hand – and I have big, fat hands – I could achieve something that approximated a vocal vibrato,” King said in his 1996 autobiography. It made King’s blues, and for many, it became the essential sound of all blues. By the early 1960s, however, King’s music lost its popularity with the rise of more slick R&B styles. But within a few years he would have a new audience: young, white and hip. King later added the title “Ambassador for the Blues”, as the US government sent him around the world for concerts, including a triumphant 1979 tour of Russia. His family life, as biographer Charles Sawyer wrote, was “never normal by ordinary standards”. He told people that when his regular dates with Lucille came between him and a woman, the guitar always won. He was married and divorced twice, and liked to say he had 15 children by15 women, but was very closed-mouth about any details. People magazine reported he had eight children. At least two of his children worked with his band, one as a backup singer. Patty King, considered the youngest of his daughters, took charge of his care at the end of his life and reportedly fought with King’s longtime manager. King made his 42nd and last studio album in 2008, One Kind Favour, that also brought him his final Grammy. He recorded the Grammy winning Riding With the King with Clapton in 2000: the cover showed Clapton in the front seat of an open limousine chauffeuring a regal King together with Lucille in the back.